Are you a seasoned beachcomber? A shelling fanatic? Then you know that there’s nothing like the thrill of finding the elusive sand dollar on the shores of beautiful Sanibel Island. If you are a novice looking for some sand dollar catching help, we’ve got the tips you need to find perfect sand dollars. At the end of the day, the sand dollar is labeled as a shell. A beautiful white shell. Avid shellers will tell you that it’s hard to find a shell as beautiful and rich as the sand dollar. Some say the sand dollar represents the story of Jesus Christ’s birth, crucifixion and resurrection. The term sand dollar refers to a species of flat burrowing sea urchins that have a rigid skeleton that allow them to move across the floor of the water. The bodies of adult sand dollars display a petal-like pattern. The best time to search for sand dollars is in the morning during a low tide. Is the Sand Dollar Still Alive? A sand dollar is no longer alive if it’s bleached white from the sun from floating in a low tide or being cleaned and washed by the rolling sand. If the sand dollar isn’t white and is black or discolored, it may still be alive and shouldn’t be touched because it’s still living within its natural habitat. To see if the sand dollar is still alive, look for velvety skin that protects and keeps the sea urchin alive. Also look for short spines, which look like fur, covering the sand dollar. The spines help the urchin move along the floor or the shore in its habitat. Watch closely and you can even see live sand dollars moving slowly on their own accord. If there’s no velvety membrane or spines affixed to the sand dollar, it’s free for you to take. The best time to search for sand dollars is in the morning during a low tide. Sand dollars are likely to ride a low tide right to shore. High tides create choppy waters and it’s hard to find them. Use this tide chart to help you plot low tides for sand dollar catching. 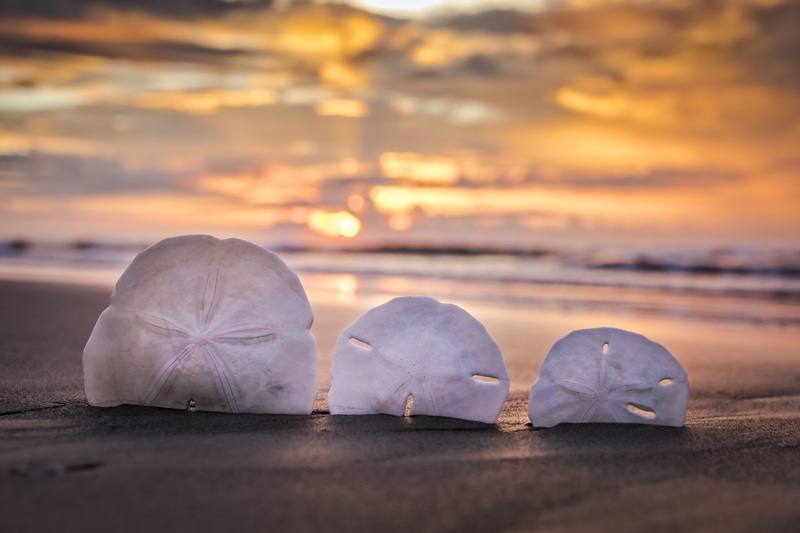 Read our blog on how to find perfect shells to get you up to speed on the perfect shelling experience on Sanibel Island. Check the weather before you go sand dollar searching. Another great time to find sand dollars is right after a storm, which churns up the water and sends the sand dollars onto the beach. Revel in the success of finding a sand dollar on Sanibel Island. Sand dollars aren’t as easy to find as shells. They like to hide under the sand and don’t always make it to shore. Try standing in shallow waters and shuffle your feet slowly into the wet sand. Perform this shell shuffle slowly enough that you don’t mix the sand into the water, which will ruin your visibility. Keep a lookout for receding waves, which expose sand dollars washing up on shore. You will be there as they arrive on shore to claim them. Keep your eyes on the ground and look for sand dollars underneath piles of shells. We promise you sand dollars are likely hiding underneath some of those shells. Use buckets to wash off and store your sand dollar and sea shell collection loot after a day of shelling. Sand dollars can be washed to become bright white. Are some of your sand dollars discolored? Try washing and soaking them in a solution of water and bleach for five to ten minutes before rinsing them. Lay them on a towel outside and let the sun take care of the rest. Looking to harden them and preserve them? Mix together white glue and water in equal portions, taking a sponge brush to cover the entire sand dollar. After they dry on some wax paper, they are ready for display or can be used in craft projects. Once you’ve spent time on shore it’s time to head out into deeper waters! Rent a boat or schedule a charter to take you out on the outer islands for a shelling excursion through our charter partners at Port Sanibel Marina. A shelling excursion will likely lead to more sand dollar discoveries. Need a place to stay? Book a fully furnished condo at Royal Shell Vacation Rentals. Call us at (239) 437-1660 to plan your trip and water sports activities today!